A knowledgeable finance and insurance manager can make good money. As a matter of fact, this position is the one of the best paid in an automotive dealership. A skilled finance and insurance manager can create profit for the dealership and are rewarded in salary. And with the help of the latest F&I software, even less experienced finance and insurance managers can perform at high levels. Modern finance and insurance platforms also make it easier for financial and insurance managers to be organized and more effective. So, how do you become a finance and insurance manager in 2019? Starting out at a salesperson at a dealership is a good first step. Once you have a good track record of sales success, you may be able to get a position as a finance and insurance manager. But, you’ve got to be on top of your game. Always treat customers with respect, maintain a professional persona and keep learning. While having a degree in finance or accounting may help you land your first gig, getting a certification as a finance and insurance manager will give you the specific knowledge and skills to get your foot in the door. This type of certification will make you stand out from the crowd. The Automotive Dealership Institute offers certification in automotive finance management both in-classroom and online. This curriculum is organized into four modules and covers a variety of topics, including finance software, laws mandated by federal agencies, structuring special financial deals, menu selling, dealership retail operating systems and finance menu presentation. And if you choose online training, modules can be paused, and you can work at your own pace. Telephone support is also available to online learners. Each section has many interactive features with voice over, printable books, graphics and examples of real-life situations. All that is needed is a high school diploma or GED along with good math and writing skills. Student loans and financing options are also available. Whether you choose online or in-classroom learning, you’re given job placement assistance across all 50 states. The Automotive Dealership Institute has a 90 percent job placement rate within 90 days of graduation and will do everything possible to help you land that dream job soon after getting your certification. The program at The Automotive Dealership Institute also qualifies for VA educational benefits. Post 9/11 vets can apply for full tuition coverage, in addition to travel expenses. So, how much will you make as a finance and insurance manager in the automotive industry? According to the National Automotive Dealers Association, around $142,000. Finance managers are paid higher or less than the average based on where they are located. They are paid the most in the West South Central area of the Unites States, at 114% of the national average. This region covers states including Texas, Oklahoma and Louisiana. 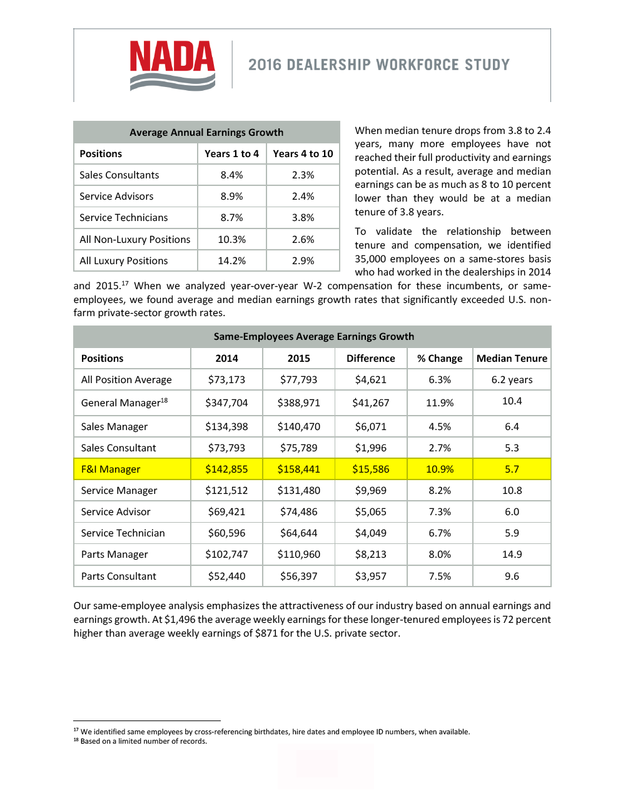 F&I managers earn the least in the East North Central region at just 87% of the average. This is the ‘Rust Belt’ area of the country including states like Michigan, Wisconsin and Ohio. That’s not bad for just four weeks of classroom training. Car sales in all 50 states are also on the increase. Dealerships sell over 17 million cars a year and new car dealerships are on the uptick also. What Finance and Insurance Managers Do? Offering car financing to clients while explaining extended warranties, dealership service procedures and aftermarket products. Processing leasing and financing deals while securing approval through different channels. Creating a program with the sales department for direct referral to them. Understanding and following local, state and federal laws with regard to the automotive industry. Training and motivating the sales team with the leasing and financing programs available at the dealership. Providing the sales team with support. Increasing profits for the car dealership. What After Products Do Finance and Insurance Managers Sell? A finance and insurance manager may sell extended warranties which kick in after the limited warranty has expired. Maintenance plans are another after product that a finance and insurance manager may sell. Plans offered include bundle oil changes and are usually limited to the dealership’s service department. Anti-theft products may be promoted also, including GPS locators, VIN etching or car alarms. Combo warranties include damage to the wheels or tires to cover bad luck with potholes. The pain and fabric protection coverage is an added chemical sealant to the paint or fabric. A finance and insurance manager may also offer gap insurance. This pays off the difference between what the car is worth and what a customer may owe after a collision. Primarily for leases, excess wear and use protection, protects in the event of scrapes or a few dents. Credit insurance plans are designed to help customers make car payments if they lose their job or are unable to make a payment due to illness. How Are Finance and Insurance Managers Doing Today? The future is looking bright for finance and insurance managers. As a matter of fact, it’s a golden era for this career. Car dealerships are driven by easy credit and low interest rates, and the market is ripe for that. And the benefits of being a finance and insurance manager are many. You’ll be offered similar benefits as any other full-time corporate position. In addition to a good salary, you’ll get retirement plans and health and dental insurance plans. Plus, many dealerships offer compensation benefits for each completed finance loan and the sale of after product plans. If you’re considering a career in F&I, be sure to carefully consider the F&I training programs at The Automotive Dealership Institute. Get trained by the best in the industry to launch your new career. Call 1-877-998-7200 to get more information or feel free to visit the F&I Training overview page on the ADI website. The Automotive Dealership Institute is a certified institution that has integrity and qualified faculty. 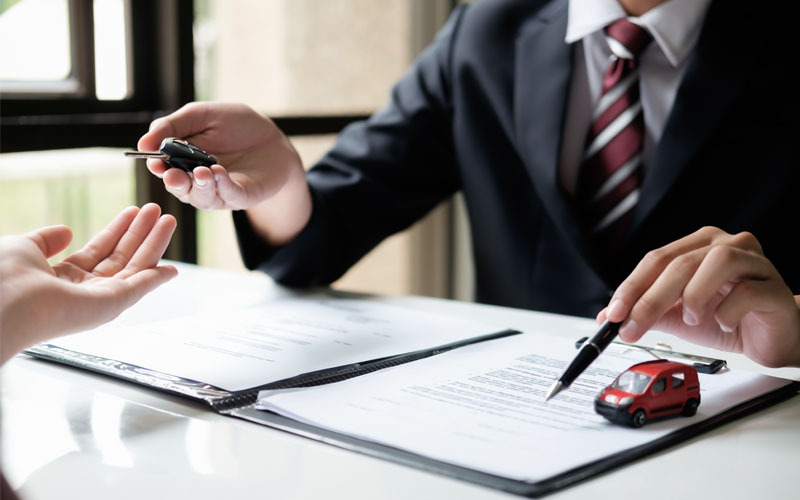 With training at The Automotive Dealership Institute, you’ll get the best possible training to prepare you for a lucrative career in automotive finance.